A couple of weeks ago, I blogged about my planning with a first grade teacher here. After teaching the lesson, the students did an amazing job with the dot images we chose to use. Some students moved the dots to make the dice look the same on both sides of the equal sign while others solved both sides. On the last image they easily decomposed the 4 into the two 2’s to prove both sides were equal so that was something we were hoping to see transfer into the dot image activity. We walked around, recorded the expressions we saw students writing, and asked students questions about their strategies for choosing cards. As I do with many lessons, in thinking about their strategies beforehand, I referred to the Learning Progressions to see how students progress through algebraic reasoning. If they didn’t know the the addition expression from memory, like 3+3 or 5+5, this clip from the progressions best describes how I was seeing students arrive at the first expression written for each given sum. Because the commutative property was the way most students found the second expression for each sum the day before, this particular day we told the students they had to use different cards than their partner in thinking about writing their expression. I especially loved this passage in the Progressions about counting on…I had never thought of counting on as seeing the first addend embedded in the total, although it makes complete sense now! I wonder how understanding that could impact the way in which I question students about their thinking when adding? These partners seemed to think individually about their expressions on the left and right sides of the board. The student on the left appears to use facts they know such as 7+3 to arrive at 4+3+3 (since there were no 7 cards). I love the use of the equal sign between the two columns! The two groups below, I remember talking to because I was so interested in how closely their sides were related. After the student on the left had written their expression, the student on the right either combined or decomposed numbers to write an equivalent expression. 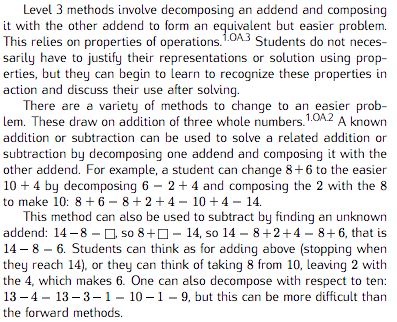 I would love to talk to both groups about the sum for 12 because I am curious if they are decomposing and making a “new” number based on what they are “taking from” another number. After playing the game, we put the equations we saw for each of the sums on the board and asked students what they noticed. Some noticed relationships between the expressions for a given sum while others looked at expressions for various sums. For example, when looking at the expressions for 10 and 15, they noticed that each expression added 5. Then we discussed whether that 5 was always a 5 and students were really comfortable saying that it could be a 2 and 3 or a 4 and 1. They could have shared their noticings for quite a while so we asked them to go back to their journals and describe something they were noticings among any of the equations. It was at this moment when I started to detach myself from the math for a quick second and began seeing how journaling really begins. I found I take it for granted that when I say write in your journal about something, that they understand how we explain our mathematical thinking. I know that writing at various grade levels differs based on so many things such as vocabulary, writing experience, and just how they write words in general. 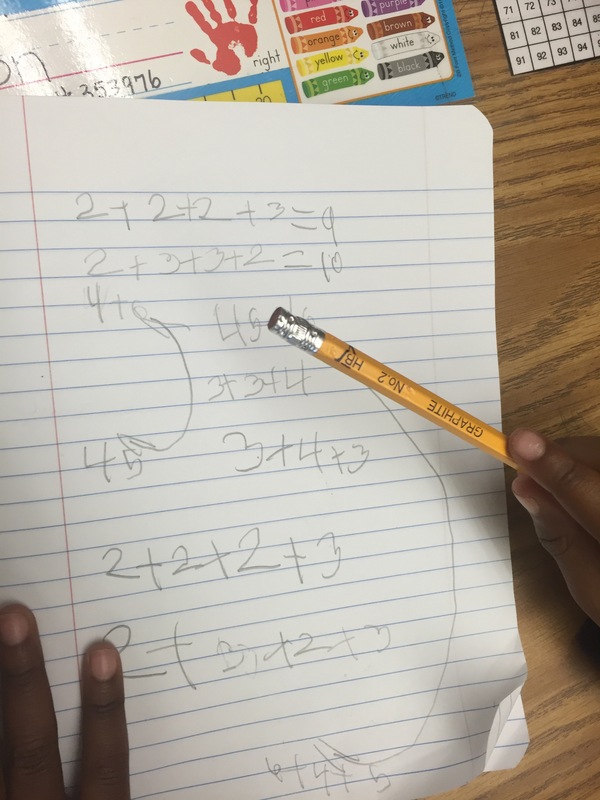 However, one thing I did not think so much about is how students view writing in math. I did not realize until I saw this student showing all of his compensation in numbers by connecting the numbers that were staying the same with lines and showing the number that was “one less” by writing -1 when going from an expression that totals 10 to a sum of 9. He explained it so beautifully but was having trouble communicating that on paper. When he finished talking a girl next to him, asked me, “Can we use words too?” <—- that is when I had an aha! Do students think about writing in math as only communicating numerically? 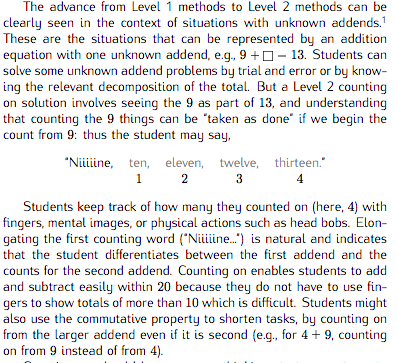 Do we ever explicitly tell them it is ok to write about math in numbers, words, or we can use both numbers and words? I think I have always assumed they knew. After they had finished journaling, the students moved to recess, however this student sat for another 20 minutes explaining to me all of the wonderful thoughts he had in his journal. The arrows were movement of numbers that were changing however being able to clearly communicate that in his writing was not something he was able to capture clearly. 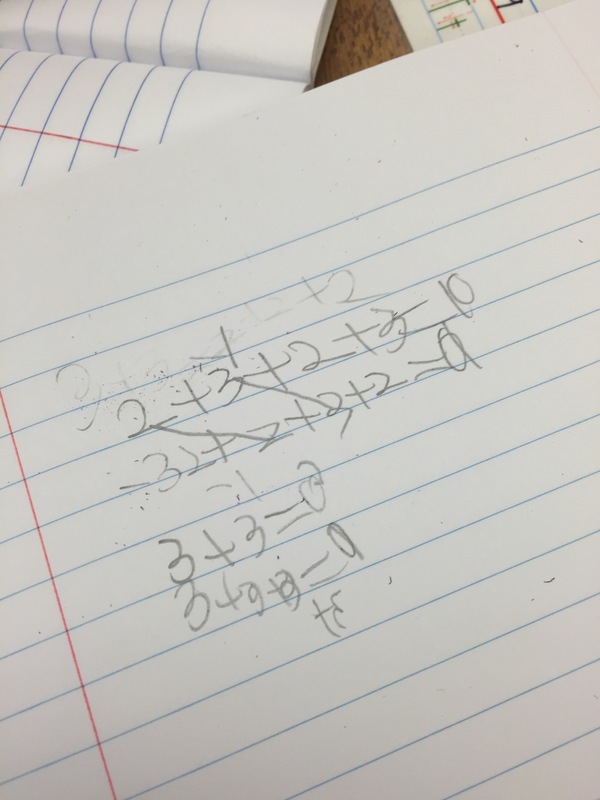 THIS is the power of writing in math I think…learning to take all of the amazing thoughts and communicate it clearly because the more he talked it out to me, the more arrows he drew, the more he elaborated on his thoughts. Moving forward from here there is so much to think about for me….in addition to moving students thinking about addition and relating that to subtraction, how do I begin to think more about journaling in math, how does it really start? For Dot Addition game I am wondering if we could allow some students the option to use subtraction? Make the range of card choices larger to allow for students to play around with that relationship. 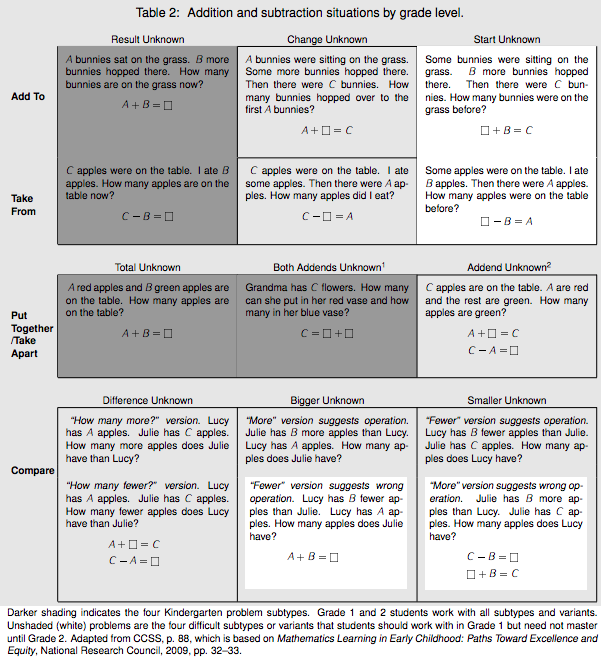 It is something that I thought about as I looked at the table in the Learning Progressions.. So much to think about each time I leave a classroom! 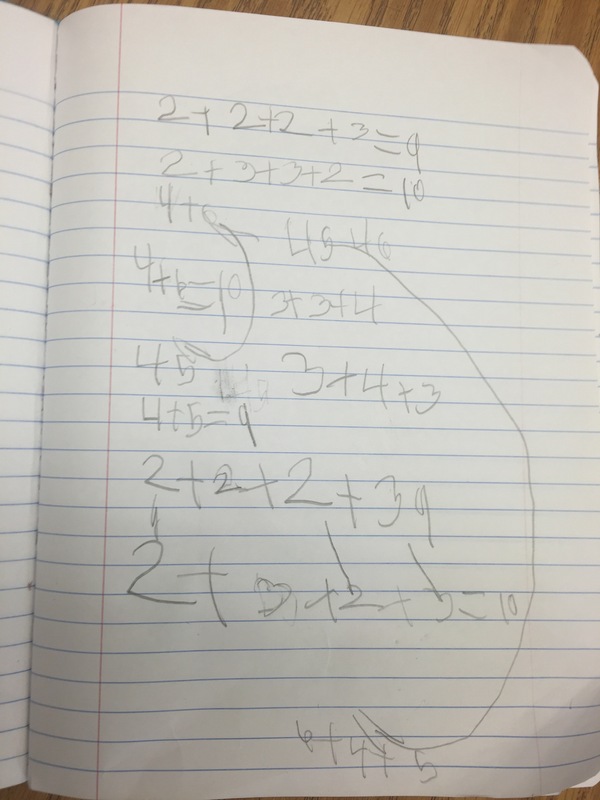 This entry was posted in 1st Grade, Addition, Journals and tagged 1st Grade, Addition, journals on November 11, 2015 by mathmindsblog.